Context: In 1985, Tyndall and Matteson first described the air cells that occur in the root of zygomatic arch and in the articular eminence of the temporal bone but do not extend beyond the zygomaticotemporal suture. Aims: The aim is to study the prevalence and patterns of pneumatized articular tubercle (PAT) retrospectively using two different imaging modalities, i.e., digital panoramic radiography and cone-beam computed tomography (CBCT). Subjects and Methods: Total 3000 panoramic radiographs belonging to 1291 females and 1709 males and CBCT scans of 200 patients belonging to 62 females and 138 males were studied retrospectively and investigated for radiographic features of pneumatized articular tubercle. Results: Prevalence found by using panoramic radiography is 1.96% and by using CBCT is 12.5%. Conclusions: This research scrutinizes the prevalence of pneumatized articular tubercle and establishes the prevalence of the same among the studied population, using panoramic radiography and CBCT. It is extremely important to have a thorough knowledge of anatomy to be able to identify pathology and formulate a differential diagnosis. The pneumatized of articular tubercle is a lesser-known anatomical variation. Tyndall and Matteson first described it in 1985 and they also reported three cases of this rare entity and termed it as zygomatic air cell defect. Pneumatization of mastoid process of the temporal bone begins after puberty and subsequently undergoes complete pneumatization in several years. In addition, during pneumatization of mastoid process, accessory cells may develop at numerous locations in the temporal bone including root of zygomatic arch and articular eminence. 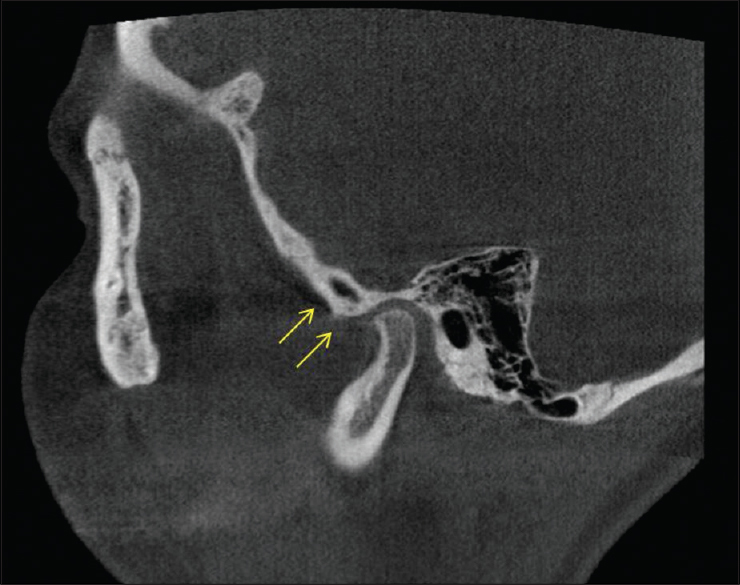 These zygomatic air cells appear as well-defined radiolucent defect with no cortical destruction of the zygoma. They do not extend beyond the zygomaticotemporal suture.,, The pneumatization can appear as a single well-defined radiolucency termed as unilocular or as radiolucency divided into small compartments by thin septae within termed as multilocular. Tyndall also termed it as “zygomatic air cell defect.” Even though pneumatized of articular tubercle and zygomatic arch is a normal anatomic variation, its presence becomes significant while planning surgeries involving the articular tubercle and temporomandibular joint (TMJ) because a pneumatized articular tubercle offers less bony resistance during surgical manipulation. The presence of air cells may also facilitate the spread of infection by providing potential pathway to the depth of the bone. Orthopantomograph (OPG) is the most commonly used presurgical imaging modality. OPG provides a good visualization of the teeth, maxillary and mandibular arches, and TMJs. Pneumatized of articular tubercle can be appreciated on panoramic radiography. 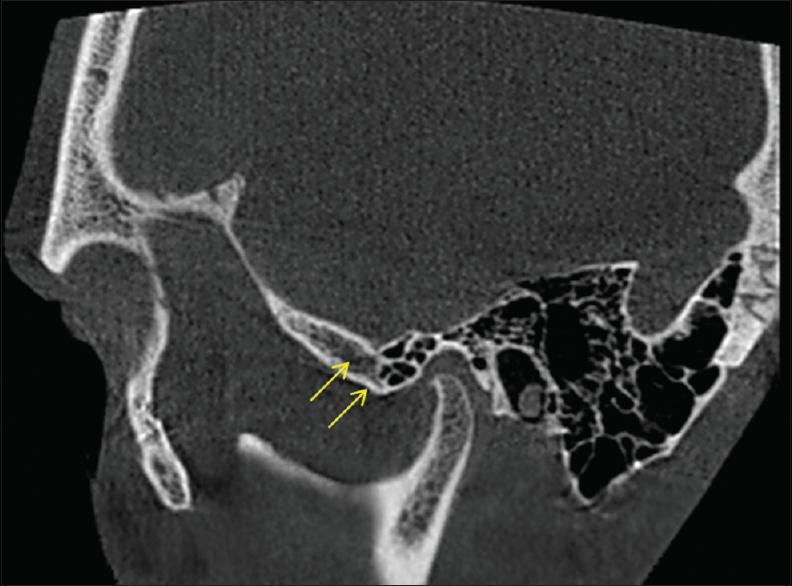 However, extensive superimposition of the adjacent bony structure may obscure this normal variation. Cone-beam computed tomography (CBCT) which is a three-dimensional (3D) imaging modality has the advantage of low radiation exposure (compared to CT) and low cost and provides 3D visualization of anatomic structure in thin slices. The present retrospective study was undertaken to assess the prevalence of pneumatized of articular tubercle (PAT) using two different imaging modalities such as digital OPG and CBCT. The study was carried out in the department of oral medicine and radiology. The samples were selected from the archived data in the institute from June 2015 to June 2016. Total 3000 digital panoramic radiographs which were free of any positioning or processing errors were selected randomly from the departmental data. Panoramic radiographs of both the genders of all age groups were included in the study. The radiographs with developmental anomalies, fractures involving mid-face region, and those with positioning error were excluded from the study. These digital panoramic radiographs were obtained using machine “Planmeca Proline EC” (Helsinki, Finland) and were viewed with “Planmeca Image Works DICOM workstation” software. CBCT scans of 200 patients were selected from the departmental records. The scans included participants of both the genders of all the age groups. Only those scans which were free of artifacts were selected for the study. These scans were obtained using machine Planmeca ProMax 3D (Helsinki, Finland), and the resultant images were displayed on Samsung monitor and analyzed using Planmeca Romexis 3.2 software to visualize the zygomatic arch in multiplanar view. Every digital panoramic radiograph and CBCT scan were analyzed by two oral and maxillofacial radiologists independently. Each observer was asked to note down the findings about the presence of pneumatized articular tubercle and its appearance. The Pneumatized Articular Tubercle (PAT) appears as a well-defined, well-corticated radiolucency in the anterior portion of the zygomatic arch but does not destroy or expand the cortices of the zygomatic arch and does not extend beyond the zygomaticotemporal suture. The Tyndall and Matteson  description of PAT was used as a guideline for classifying PAT as unilocular or multilocular. Multilocular type appears as a multilocular radiolucency showing numerous small cavities resembles like honeycomb. This study was carried out with the basic aim for ascertaining the prevalence of PAT and not to study efficacy of panoramic radiography and CBCT in the detection of PAT. The cases where there was a difference of opinion between two observers regarding the presence or absence of pneumatized articular tubercle (PAT) were excluded in the study. The data were subjected to statistical analysis. The Cohen's kappa (k) test was applied to measured inter-observer reliability, and the Chi-square test was applied to the data to assess for statistical significance. Out of 3000 cases that were studied independently by two observers, in cases, there was a difference of opinion regarding the presence and absence of PAT those cases were not included while calculating the prevalence of PAT. The Cohen's kappa test was applied to study inter-observer reliability in panoramic images. The k value obtained was 0.53 indicating moderate agreement between two observers. The Cohen's kappa test was applied to study inter-observer reliability in CBCT images. The k value obtained was 0.96 indicating near perfect agreement between two observers. The pneumatization of temporal bone is a normal physiological process. It is the extension of the pneumatization of temporal bone. The pneumatization of temporal bones can be divided into five parts; middle ear, mastoid, perilabyrinthine, petrous apex, and accessory cells that develop at numerous locations. The accessory cells include squamous, styloid, occipital, and zygomatic areas. The accessory cells in the zygomatic arch can spread pneumatization into the articular tubercle.,,, They appear as a well-defined, well-corticated radiolucent area in the zygomatic arch and articular tubercle which do not extend beyond the zygomaticotemporal suture. Tyndall and Matteson described three patterns of PAT, namely, the unilocular, multilocular, and trabecular types. In this study, the unilocular and multilocular patterns have been studied. The PAT can be visualized on Waters' view; Towne's projection, and submentovertex and transcranial view for TMJ, but these imaging techniques do not provide adequate visualization of the posterior aspect of the zygomatic arch. Panoramic radiography is routinely prescribed and easily available imaging modality which provides adequate visualization of the zygomatic arch. CBCT provides a better visualization of the mid-face region as there are no superimpositions. The present retrospective study was carried out in the same population race to find the prevalence of PAT using two different imaging modalities; panoramic radiography and CBCT. In our study on panoramic radiograph, the age range of the cases was from 5 to 91 years with a mean age of 35.5. The PAT was more common in the age group of 15–34 years. Out of the 3000 cases studied, 59 cases showed the presence of PAT. The prevalence of PAT using OPG was found to be 1.96%. Thirty-four males (1.98%) and 25 females (1.76%) were fund to have PAT. Orhan et al. and Arora et al. in their study of PAT using OPG showed the prevalence of PAT as 1.9% and 1.94%, respectively., This is in accordance to our present study. The cases evaluated for PAT on CBCT were of age range between 8 and 70 years. The PATs were more commonly seen in the age group between 21 and 30 years. From 200 cases, PAT was found in 25 patients accounting overall prevalence of 12.5%. The study done by Shokri et al. using CBCT found the prevalence of PAT 15.6%, whereas a study by Ladeira et al. found 21.3% prevalence of PAT using CBCT as imaging modality. In our study, 17 PATs were found in males (12.31%) and 8 PATs were found in females (12.9%). However, there was no statistically significant gender predilection noted. High-resolution CT is considered as imaging modality of choice for the assessment of air spaces at the base of the skull. Bronoosh et al. studied the PAT on a CT scan and reported 9.55% prevalence. Comparisons between the results of our study on CBCT had shown bilaterally located and multilocular type of PAT in contrast to the unilateral and unilocular type of PAT which is found on panoramic radiology [Table 3]. This finding can be related to the higher diagnostic accuracy of CBCT, as the 3D visualization helps to detect the pneumatization on the medial aspect of bone which can be hindered due to superimpositions on panoramic radiography. Furthermore, Multiplanar visualization on CBCT could help to detect thin septae within the radiolucency in case of multilocular variety. Various studies have been published in the literature and their results have been summarized in [Table 4]. It can be concluded from this study that the prevalence of PAT when observed using panoramic radiography was 1.96% and when observed using CBCT was 12.5%. In our study, it is observed that there is a considerable difference in the prevalence of pneumatized articular tubercle when CBCT is used as an imaging modality. Although digital panoramic radiography is an easily accessible imaging modality to examine the zygomatic arch, it poses some limitations and PAT may escape from radiographic detection. On the other hand, CBCT provides an explicit view for the recognition of PAT. This emphasizes upon the utilization of CBCT which has been of great use in dentistry. Tyndall DA, Matteson SR. 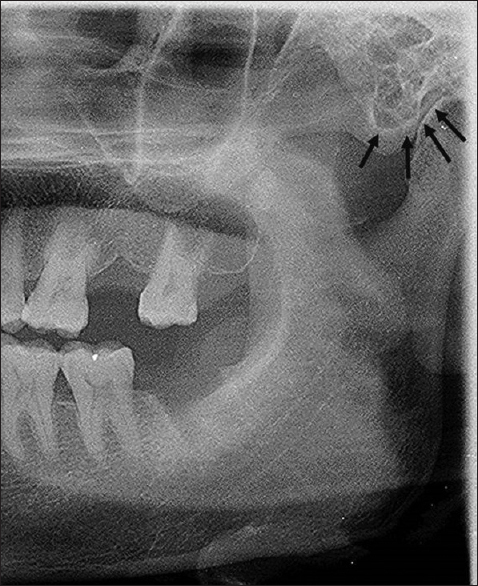 The zygomatic air cell defect (ZACD) on panoramic radiographs. Oral Surg Oral Med Oral Pathol 1987;64:373-6. Tremble EG. Pneumatization of the temporal bone. Arch Otolaryngol 1934;19:172-82. Hollinshead WH. The Head and Neck. Anatomy for Surgeons. 2nd ed., Vol. 1. New York: Harper SC Row, Publishers; 1968. p. 190-4. Patil K, Mahima VG, Malleshi SN, Srikanth HS. Prevalence of zygomatic air cell defect in adults – A retrospective panoramic radiographic analysis. Eur J Radiol 2012;81:957-9. Abramovitch K, Rice DD. Basic principles of cone beam computed tomography. Dent Clin North Am 2014;58:463-84. Park YH, Lee SK, Park BH, Son HS, Choi KS. Radiographic evaluation of the zygomatic air cell defect. Korean J Oral Maxillofac Radiol 2002;32:207-11. Yavuz MS, Aras MH, Güngör H, Büyükkurt MC. Prevalence of the pneumatized articular eminence in the temporal bone. J Craniomaxillofac Surg 2009;37:137-9. Hofmann T, Friedrich RE, Wedl JS, Schmelzle R. Pneumatization of the zygomatic arch on pantomography. Mund Kiefer Gesichtschir 2001;5:173-9. Ladeira DB, Barbosa GL, Nascimento MC, Cruz AD, Freitas DQ, Almeida SM, et al. Prevalence and characteristics of pneumatization of the temporal bone evaluated by cone beam computed tomography. Int J Oral Maxillofac Surg 2013;42:771-5. Miloglu O, Yilmaz AB, Yildirim E, Akgul HM. Pneumatization of the articular eminence on cone beam computed tomography: Prevalence, characteristics and a review of the literature. 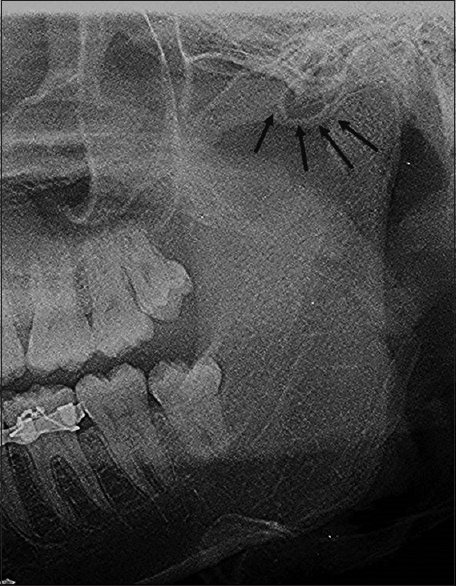 Dentomaxillofac Radiol 2011;40:110-4. Neville BW, Damm DD, Allen CM, Bouquot JE. Oral and Maxillofacial Pathology. St. Louis: Saunders Elsevier; 2009. p. 541-669. De Vos W, Casselman J, Swennen GR. Cone-beam computerized tomography (CBCT) imaging of the oral and maxillofacial region: A systematic review of the literature. Int J Oral Maxillofac Surg 2009;38:609-25. Orhan K, Delilbasi C, Cebeci I, Paksoy C. Prevalence and variations of pneumatized articular eminence: A study from Turkey. Oral Surg Oral Med Oral Pathol Oral Radiol Endod 2005;99:349-54. Arora KS, Kaur P, Kaur K. ZACD: A retrograde panoramic analysis among Indian population with new system of classification. J Clin Diagn Res 2016;10:ZC71-3. Shokri A, Mortazavi H, Salemi F, Javadian A, Bakhtiari H, Matlabi H, et al. Diagnosis of simulated external root resorption using conventional intraoral film radiography, CCD, PSP, and CBCT: A comparison study. Biomed J 2013;36:18-22. Shokri A, Safi Y, Mortazavi H, Baharvand M, Fallah-Koshki S. Cone beam-computed tomography evaluation of pneumatized articular tubercle. Int J Clin Dent 2015;8:63-71. Bronoosh P, Shakibafard A, Mokhtare MR, Munesi Rad T. Temporal bone pneumatisation: A computed tomography study of pneumatized articular tubercle. Clin Radiol 2014;69:151-6.